If you live in an area that gets hit with all four seasons, keeping your property looking pristine requires a lot of different equipment. You need a lawnmower to keep your grass in check during the warm season, a leaf blower to make it through fall, and a snowblower to get your car out of the driveway in winter. Not only is that a lot of money to spend on maintenance machinery — all that gear also requires a fair amount of storage space when its not in use. Wish there was a better way? Well good news: Troy-Bilt has created a new line of property maintenance equipment that allows you to perform multiple jobs from one central piece of equipment. 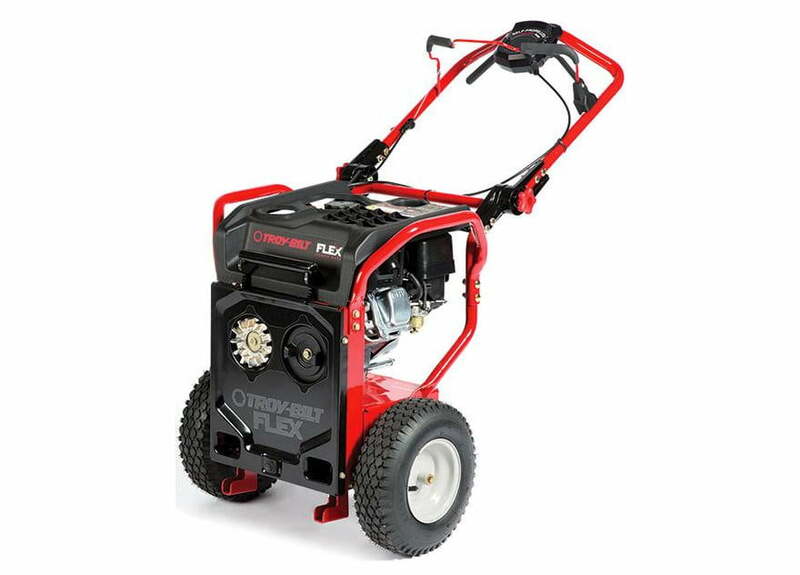 With the Flex line, instead of buying a standalone lawnmower, leaf blower, snowblower, etc; you simply buy one motor (which is pretty beastly at 208cc’s), and then swap out the different attachments as needed. This modular design has a handful of benefits. For starters, you only have to maintain one motor, which is definitely a plus (how many times have you almost thrown out your arm trying to start your lawnmower after letting it sit idle for nine months?). And second of all, all the attachments will presumably take up less space than full-sized equipment. Think of what you could do with all that extra room in your shed! There is one big drawback to all this. Unfortunately, all of Troy-Bilt’s Flex line’s attachments cost just as much — if not more than — their standalone counterparts. The lawnmower and snowblower attachments will cost you $500 and $400, respectively; whereas the the leaf blower and pressure washer will both cost $280. Add that to the cost of the central motor, and you’re looking at a hefty price tag. We’re not entirely sure it’ll be worth it, but time will tell. If it turns out that the Flex line can match the perfomance of some higher-end standalone machines, then it may well be worth cost. Stay tuned for a review, as Troy-Bilt is slated to roll out the line to Lowes stores across the country next Spring.